Once in a while, as I wander through the interwebz, I come across things that are truly bad ideas. I once posted some Spam recipes here that were awe-inspiring in their scope of bad idea-dom. Well, today I ran across an old magazine ad that I had to share in that spirit. This one is so bad, it makes my mind shy away from it. And the fact that it’s being served in an elegant and classy soup tureen just makes it more so. 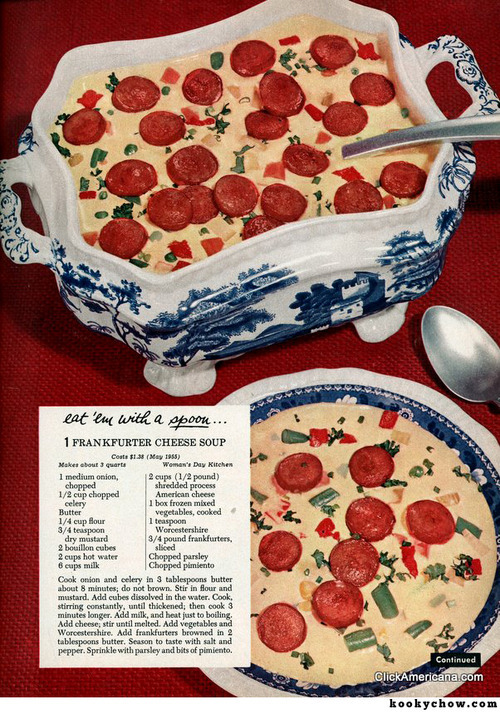 It’s basically a melted American cheese and hot dog soup. With a few sautéed vegetables thrown in. Truly bad. The mind reels. Using condensed soup as a base for other soups or casseroles is not inherently bad, and I’ll share a really good one in a moment. Some of the more popular soups are cream of mushroom, cream of celery, cream of broccoli, etc. My mom once made a spaghetti sauce following instructions from a friend that used cans of cream of tomato, cream of mushroom, and a bunch of herbs. Didn’t really taste all that good, but it did make a kind of spaghetti sauce. Years later, that recipe had bubbled away in the realms of my subconscious, and I came up with a fast and quick Italian recipe that I use occasionally when I’m short on time. Start a large of water to boiling for fettuccine. I like to use a thicker pasta for this. While that’s getting itself ready, empty 2 cans of cream of chicken soup and one can of cream of celery soup into a medium sauce pan. Add a half-cup of water and one tablespoon of Italian spice mix and mix thoroughly. Heat to boiling and let simmer until pasta is ready. When pasta is done, drain but do not rinse. Put pasta in a bowl, and put hot soup over the pasta. Toss to coat, and sprinkle with parmesan. Serve hot. Easy peasy. Tasty, filling, cheap, and quick. Couldn’t ask for much more.